Ideal for both group worship, personal prayer, meditation and casual listening, these collections of Gregorian chants feature timeless chants, expert vocal performances and beautiful choral arrangements. Following the success of Gregorian Melodies: Popular Chants, Volume I, the monastic choir of St. Peter's Abbey, Solesmes, has released this second volume of popular chants with selections that include Te Deum, Stabat Mater, Ave Maria, chants for the Liturgical Year from Advent to Pentecost, chants devoted to Our Lady and the Blessed Sacrament and the Mass of the Angels. Accompanying each selection are page numbers corresponding to the Liber Cantualis. Sensitive performances from the monks and director Dom Richard Gagné; make this collection suitable for worship, personal prayer, meditation and casual listening. Sung with grace and style by the monastic choir of St. Peter's Abbey in Solesmes, France, the Gregorian chants on this beautiful CD date to between the 10th and 17th centuries. This versatile collection is ideal for both group worship and personal prayer, and it will appeal to those who are already familiar with the chant liturgy as well as those who are new to Gregorian chant. Melodies on this first volume are from the Liber Cantualis and include Tantum ergo, Adoro te, hymns from the service of Compline and much more! Sung with grace and style by the monastic choir of St. Peter's Abbey in Solesmes, France, the Gregorian chants on Gregorian Melodies: Popular Chants, Vol. I date to between the 10th and 17th centuries. Melodies on this first volume are from the Liber Cantualis and include Tantum ergo, Adoro te, hymns from the service of Compline and much more! 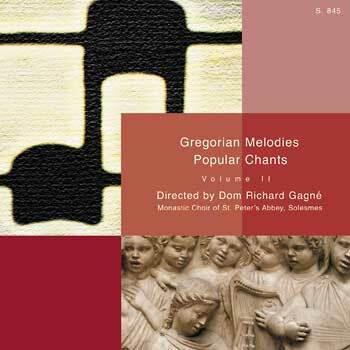 Following the success of Gregorian Melodies: Popular Chants, Volume I, the monastic choir of St. Peter's Abbey, Solesmes has released the second volume of popular chants with selections that include Te Deum, Stabat Mater, Ave Maria, chants for the Liturgical Year from Advent to Pentecost, chants devoted to Our Lady and the Blessed Sacrament and the Mass of the Angels.